What this Palmolive shower gel claims: The secrets of thermal massage transported to your shower! With white clay and thermal minerals, its unique formula provides a gentle scrubbing action and massage feeling experience. Your skin feels velvety soft and your body relaxed in a delightful home spa experience! Palmolive thermal spa shower gel can be used with a loofah or by hand. Directions for Use: Pour a little Palmolive Thermal spa shower gel on your wet loofah. Apply gently over your wet skin. For best results, use loofah to work up rich, fragrant lather before rinsing off. Palmolive shower gel ingredients: Water, sodium laureth sulfate, cocamidopropyl betaine, butylene/ethylene copolymer, xanthan gum, perfume, PEG 8, sodium chloride, hydroxypropyl guar, DMDM hydantoin, tetrasodium edta, kaolin, citric acid, benzophenone 4, methylchloroisothiazolinone, methylisothiazolinone, sodium bicarbonate, magnesium sulfate, potassium chloride, Cl 42090, Cl 60730. This Palmolive shower gel India comes in a transparent bottle with the sky blue colored shower gel filled into it. The shower gel contains exfoliating granules, which are white in colored. 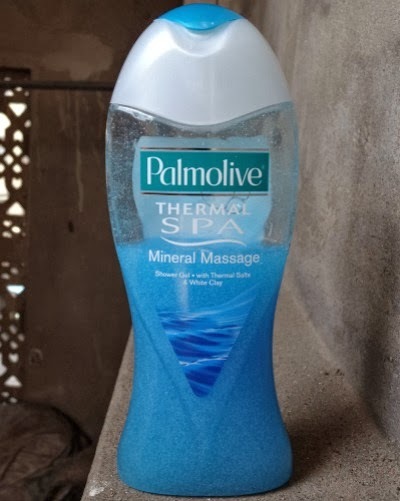 The Palmolive Thermal Spa Mineral Massage Shower gel claims to contain white clay and thermal salts and smells mild, like male perfume and I am sure most of you would like the fragrance. It has a flip-open cap, which is not so sturdy and thus traveling with it becomes a bit difficult. The fragrance does not linger on after a bath. You can definitely buy Palmolive shower gel online or buy shower gel from your local store. Availability of this shower gel India is not a problem. The shower gel is gooey and slippery in consistency, does not lather much but cleanses the skin effectively. It does mildly exfoliate the skin and is perfect for daily use! It never irritated my skin or anything and I loved this shower gel a lot, to be honest. Also, this body wash neither dries nor moisturizer the skin and keeps it normal but I am sure that we all would need a good moisturizer after using this in winters. This shower gel is suitable to almost all skin types. It leaves no slippery feel behind and my skin feels soft after using this and also a bit glowing as this shower gel gets rid of all the dead skin cells. However, if you are looking for deep down exfoliation then this is not for you. I have used this earlier decent bodywash for the price! Great product! I have tried it! Would you like to follow each other via GFC, bloglovin, facebook and instagram? Thank you so much dear ^_^ I am so glad that you found my review good! Sounds nice. Just wish it would be a bit more gritty for scrubbing.